Together with Elite Fine Food, we launched our inaugural TE MANA LAMB chefs’ dinner in Singapore. 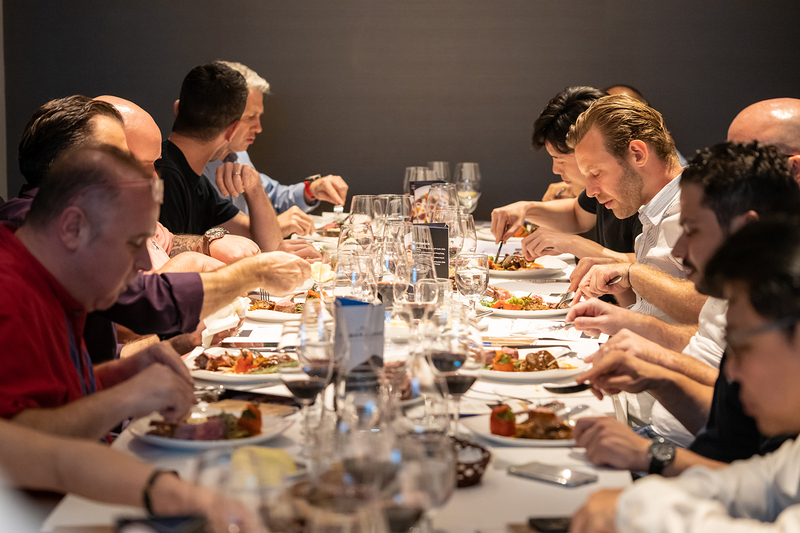 We hosted 11 top chefs from renown establishments – Capella Hotel, Raffles Hotel, soon to open La Dame de Pic, Bedrock Bar & Grill, Table at 7, TWG, Le Bistrot Du Sommelier, Brozeit, and Bar a Thym. It was a great time for the chefs to taste and marvel at TE MANA LAMB. Leading food company Alliance Group has won two major food awards for its premium TE MANA LAMB. TE MANA LAMB, developed as part of The Omega Lamb Project, won the New Zealand Food Safety Primary Sector Products and Frozen categories at the New Zealand Food Awards, which showcases the best of New Zealand’s food and beverage industry. The premium lamb has higher levels of polyunsaturated (good) fats and omega-3 fatty acids, which results in an entirely new lamb taste experience with outstanding succulence, tenderness and flavour. It’s on the menu of a number of exclusive Hong Kong, New Zealand and UK restaurants and the award-winning home delivery food service My Food Bag’s My Gourmet Bag range. Peter Russell, General Manager Marketing, Alliance, said the awards win highlighted the co-operative’s commitment to capturing more market value. “TE MANA LAMB is now commanding a premium in key markets and the feedback from chefs has been outstanding. The development of this innovative product is the result of a collective effort between the co-operative and dedicated and visionary farmers, supported by the government. “TE MANA LAMB has also reinforced New Zealand’s position as the home of the world’s best lamb. This lamb has been a major drawcard for a new generation of foodies and entirely new consumer segments and markets that previously weren’t interested in or had lapsed consumption of lamb. It found that the right combination of genetics, management and forage can alter the fat profile of lamb and produce animals that are healthy, while delivering a demonstrably healthier product for consumers. Yesterday’s awards represented further industry recognition for this unique product, with TE MANA LAMB receiving the 2017 Innovation Award for New Zealand’s Most Innovative Food. The winners were announced on Wednesday 17th October at SKYCITY, Auckland. KELLI BRETT DISCOVERS LAMB IS NOT JUST LAMB ANYMORE. LAMB. A DEFINITE KIWI FAVOURITE. Or is it? A report earlier this year by the Organisation for Economic Co-operation and Development (OECD), said New Zealand’s annual sheep-meat consumption has dropped to around 900 grams per person. In 2006 it was 19 kilograms per person. There are claims that the OECD report may be distorted, but we do appear to be eating less lamb. Meat consumption in general continues to receive a thrashing from animal-rights advocates and plant-based nutrition gurus. Mondays are now officially meatless and our social feeds are crammed with exciting vegetarian and vegan recipes that encourage us to think beyond the standard piece of protein accompanied by 2-3 token veg on our plate. With price point being a major deciding factor for many of us and with pork and poultry being (for the most part) cheaper options, New Zealanders might be looking at that leg or rack of lamb as a special treat, no longer a week-night ingredient. So perhaps the future for New Zealand lamb lies more within the premium arena? There were a number of great New Zealand lamb producers who wanted to be in this special NZ issue of Cuisine. I want to be transparent with you about what we want to achieve here. I chose TE MANA LAMB because of the many interesting elements they can bring to this story. Science, genetics, technology, integration with the farmer and the consumer and, most importantly, traceability. And no, TE MANA LAMB did not pay to be included. BRINGING BACK THE FAT My journey started in the South Island at Mt Burke Station located between two magnificent lakes, Wanaka and Hawea. The current owner Tim Burdon is the third-generation Burdon to farm the land. Tim and his manager Grant Ruddenklau talked me through the realities of farming sheep that are specifically bred for the New Zealand high country. The TE MANA LAMB programme has emerged from the Omega Lamb Project Primary Growth Partnership involving Alliance Group Limited, Headwaters and the Ministry for Primary Industries. It has evolved from over 10 years of experimentation with the aim of developing a breed that comfortably forage beyond the flat, easily accessible and valuable farming space. Over 500 genetic lines were tested to find the ultimate ram. The George Clooney of rams was Ram 211, whose offspring have thrived in the high country. Each year 80 new sires are tested, and the very best enter the elite breeding programme across the 33 farms currently working with TE MANA LAMB. While breeding these sheep to be healthier and better adapted to a highcountry environment the scientists and farmers discovered something new. The sheep had developed an intramuscular fat, with marbling, richer in Omega-3 than any other red meat. For over 30 years the industry has been taking the fat out of our lamb to conform with a consumer demand for leaner meat. Now TE MANA LAMB is putting the fat back in. YOU ARE WHAT YOUR MEAT EATS My next stop was at Waifield farm, where the lambs that are bred at Mt Burke Station are delivered to spend their final 30 days. Here they graze on chicory herb pastures that contribute to the naturally high levels of Omega-3. Steven Romes, his wife Helen and son Scott work the farm and take great pride in their part of the project process. They tell me that the integrated approach from TE MANA LAMB has made them think differently about their product. Being encouraged to work alongside the developers and processors and then having opportunities to meet the chefs that cook with their lamb has meant that their own journey no longer ends with watching the lambs go out the gate. They have become interested in more than just the end price. After a good look around the farm and a walk through the lush chicory fields Steven fires up the barbecue and I’m treated to lamb racks, fillets and Helen’s amazing corn salad. Having those beautiful lambs just a few paddocks away, ignorantly going about the business of fattening themselves up for slaughter made me think a lot more about the food on my plate. Perhaps it was the fresh air, perhaps it was because I needed it to be good after feeling a connection to the lambs: it was pure and honest, no intricate cooking techniques or sauces, just lamb straight off the barbie and it was pretty damn good. Actually, it was excellent. THERE HAS TO BE A BUTCHER After my night at Waifield farm, I’d intended to pop into Queenstown for a lovely lunch of said branded lamb and then fly back to Auckland. But, on discovering that the Alliance Lorneville plant was only an hour away, I wanted to see it. What’s the point of being on a journey if you can’t reach the end point? After a few phone calls I was cautiously granted permission. This is the part where it gets tricky, the part where most people disconnect. Why doesn’t anyone want to talk about the fact that eating meat means that animals are killed? The current focus for TE MANA LAMB is to build brand awareness with New Zealand chefs and yet most of the chefs I have spoken to have not witnessed the end process. I needed to see it. Just getting into the plant was tedious: after much hand washing, hair netting, donning of hygienic jumpsuits, plastic gloves, protective goggles and commando-style gumboots, I waded through what felt like miles of bootwashing troughs and finally made it to the processing floor. They started me off at the boning and packaging end. I was mesmerised by the creamy pale-pink skinned lamb whizzing past on hooks, quite beautiful in shape, all exactly the same size. I wasn’t ready for the display of human skill, almost like watching a well-choreographed ballet. Precise, tight, neat, sharp, repetitive, every movement fully planned and artfully executed. The finished cuts were clean and impressive with almost every part used and accounted for. I’m told that TE MANA LAMB is even developing a range of stocks to put the flavourful bones to good use. I met senior supervisor Allan Brunton, who talked me through the intricate and rigorous processing requirements for the TE MANA LAMB product. A key aspect is that every piece of lamb that leaves that floor can be traced from behind the farm gate to the boning room. This makes it possibly the most traceable of any lamb programme in the world. I was taken by Allan’s overwhelming sense of pride in the job as he talks about the professionalism on the floor. The Lorneville plant processes a number of different lamb products but Allan believes his team prefer to work the TE MANA LAMB shift because of the consistency in size and weight and the texture, “like slicing butter”. I ask about the team, “Do they even eat lamb considering what they have to do all day, every day?” He tells me the staff-discount offers are always a sell out. AS WE MOVE FURTHER down the line towards the area where the lambs enter the processing line I’m asked a number of times if I want to proceed. So far I’m distracted by the slickness of the operation, the intense concentration on the faces of the processing team and the dance that the high-tech machinery performs around them. But really, what did I expect? I know that with my decision to eat meat comes a requirement for me to be OK for an animal’s life to come to an end. I’m glad TE MANA LAMB were brave enough to let me in to experience this, as it is an important part of the story. The reality is that if we want to eat meat someone needs to be the butcher. My experience at TE MANA LAMB reminded me of childhood trips with mum to the local butcher, and of his knowledge and pride in his product. As a result, I’m thinking a lot more about the difference between average lamb and premium lamb. And so, instead of bringing you pictures of fluffy lambs and lush green pastures, Cuisine art director Fiona Lascelles and photographer Jason Creaghan were charged with the difficult task of photographing the butchered parts of a whole raw lamb. We hope that you might consider the part of the process that is not usually discussed, that bit within the paddock-to-plate story that is usually left out. If you choose to eat meat, then you should understand, accept and appreciate the whole journey from beginning to end. It is heartening to hear that chefs are requesting more and more the underused cuts along with the familiar. This article originally featured in the April issue of Cuisine magazine. The programme behind a new kind of premium lamb recently won a New Zealand Innovation award, but how can meat be innovative? That’s exactly the perception that inspired the Omega Lamb Project, a decade-long partnership between red meat co-operative Alliance, the Ministry of Primary Industries and farmers’ collective Headwaters, to develop TE MANA LAMB. “TE MANA LAMB is effectively a reset button for lamb globally,” says Alliance’s Peter Russell, adding that chefs around the world “are going bonkers” for the product, described as the lamb equivalent of wagyu beef. This article was originally featured in Air NZ’s Kia Ora magazine. Genetics and chicory are giving rise to a high-country sheep so tasty that the meat industry sees it as a potential saviour. Languishing lamb sales could be in for a boost from a project that aims to produce sheep meat to rival wagyu beef. Sheep, which number about 27 million in this country, are the fourth-most-eaten livestock in the world. But, with consumption at 1.7kg per capita in 2016, they’re way behind chicken (29.9kg), pork (12.3kg) and beef and veal (6.5kg). This year, New Zealand produced an estimated 23 million spring lambs, down 1.3% on 2016. That has global significance for lamb supplies since, with Australia, we account for three-quarters of the international trade in sheep meat. Most lamb goes into the retail channel, which critics say means producers earn commodity prices for a product that, on scarcity value alone, should be making them more. But the Omega Lamb project, a joint venture between farmers, geneticists, agronomists, meat exporter Alliance Group and the Ministry for Primary Industries, is bumping a tiny amount of the meat further up the value chain. The lamb, which is the product of a breeding and targeted feeding programme, is sold under the Te Mana label by Alliance. It’s the commercial endpoint of a primary growth partnership (PGP) that grew out of AgResearch work on making hardier and fatter ewes to cope with high-country farms. They’ve spawned a champion: a melt-in-the-mouth, mild-smelling meat that is being sold for more than prime beef at restaurants in trials in New Zealand and Hong Kong. Participating chefs have used it instead of wagyu beef on sushi. It targets the same marbled intramuscular fat that melts and makes the meat succulent. Just 60,000 Omega lambs are forecast this year from participating farmers, double the 2016 output, and that rate of growth is expected to continue for at least the next two years. “This is a product positioned above health food. Foodies and health nuts are extraordinarily demanding and don’t mind paying good money,” says Tom Sturgess, a naturalised Kiwi since cancer spurred him to give up corporate life in the US for running Nelson-based Lone Star Farms, which produces 70,000 lambs on six properties. That’s not to say participating in the venture is an easy ride, he says. “This stuff is extremely difficult to grow. Fastidious care has to be taken to adhere to the protocols of the programme. Sturgess says the strategy is similar to that of NZ King Salmon, which he used to chair and which is now listed on the NZX. “NZ King Salmon – just 0.5% of all the farmed salmon in the world. The chefs love it. It differentiates their restaurants, and customers love it,” he says. The Government has put $12.5 million into the project over seven years, the same as the other partners, for a forecast economic benefit of up to $400 million over 25 years. Sean Marshall, head chef at Wellington’s Matterhorn Restaurant, which has been trying out the Omega-produced lamb, is positive about it. That’s the sort of feedback that gives investors in the project confidence about increasing production. This article was first published in the November 18, 2017 issue of the New Zealand Listener. Southern meat company Alliance hopes its Innovation Awards win with its Te Mana Lamb brand creates a new poster child for the sheep meat industry. The lamb brand collected the top award in the food category and was runner-up in the innovation excellence for research sector. It also came in as a finalist in the agribusiness-environment and export innovation awards. Alliance marketing manager Peter Russell said he and his colleagues had been challenged about the legitimacy of entering a lamb product into awards that highlighted cutting-edge products from all sectors of the economy. But the hard graft of intensive scientific research and breed development meant the lamb with high omega 3 and polyunsaturated fats had taken the traditional red meat product to a whole new level of consumer appeal and premium potential. The win represented a corporate highlight for a company that had tended to trail in the shadow of competitor Silver Fern Farms that had claimed the spotlight with its popular pre-packaged and portioned quality meat cuts. The brand emerged from the Omega Lamb Project, a Primary Growth Partnership between Alliance, farmer group Headwaters and the Ministry for Primary Industries. Now in its second of its seven-year lifespan, the project had $25 million of input from the Government and industry, split evenly. In finding alternative feed regimes for sheep using chicory as a source, the researchers also bred a selection of whiteface sheep scanned for taste and fat levels. That flock also demonstrated high levels of healthy omega 3 and intramuscular polyunsaturated fats. While acknowledging the health benefits of the lamb, Russell said it was the taste that was driving uptake by high-end consumers and the chefs cooking for them. Certain parts of the carcase had higher omega and polyunsaturated fat levels than others, providing opportunities for products like pet food or opportunities to extract fats that could be formulated as ingredients for nutritional or food products. While the PGP programme had its critics, not least new Agriculture Minister Damien O’Connor, Russell said the programme had been invaluable for providing the investment needed for some expensive early research work. “We started out seeking a way to better farm sheep in the high country and discovered a fat profile quite different to other sheep. The company was looking to expand beyond the core group of southern farmers running the sheep. “Farmers seeking to be part of Te Mana have to buy the rams that carry the trait and would have to subscribe to the chicory-based forage system. However, the company had no plans to expand into supermarket retail for the lamb, keeping it focused at top-end restaurants here and abroad and My Food Bag’s Gourmet Bag range. Russell was optimistic farmers supplying the lamb would be paid a premium for their efforts this year. “I take my hat off to those farmers that started off, taking the risk with it and doing the work early on. The supreme NZ innovation award was claimed by the Rocket Lab space venture company, with its new launch base at Mahia Peninsula. This article was originally featured on Farmers Weekly. A new kind of premium lamb which has sparked the palettes of foodies in New Zealand and Hong Kong has won praise for its innovation. The Omega Lamb Project, which has developed Te Mana Lamb, won the Innovation in Food and Beverage category at the New Zealand Innovation Awards. Te Mana Lamb has higher levels of good polyunsaturated fats and omega-3 fatty acids which make the meat tasty and succulent. Alliance Group general manager marketing Peter Russell said the win was a rewarding validation for the project. The Omega Lamb Project is a Primary Growth Partnership involving Alliance, Ministry of Primary Industries and a group of farmers known as Headwaters. It is the culmination of a decade of research and development. Headwaters geneticist Aimee Charteris led the work. She was approached 10 years ago to design the breeding programme for Headwaters but made it know that she couldn’t create a plan where there were penalties for fat. “One of the things I couldn’t get my head around in the industry was the fact that we were selecting against fat. From a biological point of view, it is critical for survival and essential for taste. Charteris said she wanted to produce an efficient, productive composite animal with some “serious points of difference.” She chose the perendale because of its hardiness; the romney as a base breed to create meat volume; the finn because of its prolificacy and the texel because of its muscle mass. 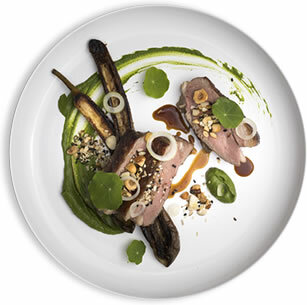 Te Mana Lamb is raised in the high country in spring on farms ranging from North Canterbury to Southland. In summer, lambs are brought down to finishing farms to graze on chicory and chicory/red clover pasture. “The diet nutritionally conditions the meat,” said Charteris. “That assists with the good pH in the meat and also makes sure the animal is growing and in my opinion has a robust immune system, so it’s got high energy flowing through its body the entire time. “Consequently, it’s not only excellent when it lands on the plate, but it’s also fundamentally incredibly good for the animal while it’s in the production system,” she said. Headwaters project manager Mike Tate said Te Mana Lamb was at this stage aimed at the fine dining experience. Headwaters is looking for more farmers to get on board as it looks to increase production of Te Mana Lamb based on market demand. Te Mana Lamb is now on the menu of a limited number of exclusive Hong Kong and New Zealand restaurants and is commanding a significant premium. It is also available through the home delivery food service My Food Bag range. This article originally featured on NZ Farmer. The Omega Lamb Project, a Primary Growth Partnership (PGP) programme involving leading food company Alliance, Headwaters and the Ministry for Primary Industries (MPI), has developed TE MANA LAMB, a new kind of premium lamb. New Zealand has struggled for some time to escape the commodity trap. Exporters have been despatching undifferentiated commodities like lamb to customers in the four corners of the world for more than a century. However, there has been significant progress in the red meat sector to break away from this ‘race to the bottom’, with a number of initiatives and programmes underway. One programme, which was formed in 2015 and where there is evidence of innovation and a move towards change from farmers and partners, is the Omega Lamb Project. This is a PGP programme involving farmers known as Headwaters, and MPI. The project has developed TE MANA LAMB, which is a good illustration of what can be achieved. It is creating new value for lamb and sparking a renaissance in the global appetite for New Zealand’s premium meats. The genesis of the Omega Lamb Project began with a programme to produce sheep with the fat levels needed to better breed and thrive in the South Island’s high altitude pastures and conditions. It was while breeding sheep to be healthier and better adapted to this harsher high-country environment that it was realised that the fats in lamb (not lean muscle) that were the key, both for the animal and the consumer. This led to 10 years of scientific search, discovery and natural breeding of sheep with a different type of fat, an intramuscular fat, higher in omega-3 with marbling on a micro-scale – something never before seen in lamb. Those involved in the project took this new breed and researched rearing locations and conditions, farming practices and finishing grazing to produce an entirely new lamb eating experience. All this was achieved using natural breeding, and outdoor pasture-based farming, but underpinned by modern individual animal recording and product analysis. Staff at the Omega Lamb Project have worked hard to develop the precise combination of genetics, management and feeding to alter the fat profile of the lamb. It has involved a focus on a very different way of doing things, through a partnership between breeders, finishers, marketers and distributors, with the aim of adding value to the total system – not just to any individual part. The goal has been to produce the world’s tastiest and healthiest lamb. The outcome is an animal with exceptional meat qualities, well suited to our high-country conditions, with a unique genetic profile and nutrition that enhances omega-3 levels. The animals are a selection of New Zealand white-faced breeds bred specifically by Headwaters for the Omega Lamb Project. Hundreds of genetic lines are screened for taste and fat characteristics. Because the breed was developed by the project the parentage of these lambs can be traced right back to the first sires. Animals are selected only at the very top end of natural variation in omega-3 and polyunsaturated content for lamb, and they are then farmed in systems that further enhance omega-3 levels. The process is now complete to make official ‘Source of Omega-3’ on a pack claim for some cuts. The project has been built on an all-natural farming system, integrating unique genetics with specially developed agronomy. Lambs are bred in the high country and exclusively grass-fed. Post-weaning, they are moved to low-land farms to be finished on specially developed chicory herb-based pastures. The lambs have greater stores of muscle glycogen, low pH and exceptional and consistent taste, tenderness, succulence and colour with rich marbling, including the omega-3 fats. The meat also doesn’t behave like regular lamb when cooking. Because it is full of ‘good fat’, it has essentially less moisture. That means it doesn’t suffer shrinkage, retains its shape, flavour and texture and is more versatile. TE MANA LAMB was launched in New Zealand and Hong Kong this year, with plans for a wider roll out underway. It is not a supermarket lamb. It is a premium product aimed at the fine dining market, and the reaction from that market has been exceptional. In January, the Omega Lamb Project brought leading New Zealand chefs and food writers from across the country together to try the lamb and visit some of the farms involved in the project. Their response was that this is a lamb like no other – delicately flavoured, clean and succulent, and without the strong odour associated with traditional lamb. That has also been the wider feedback as TE MANA LAMB has been rolled out to fine dining restaurants here and in Hong Kong. Chefs are saying it is proving popular with diners who do not usually like lamb and provides scope to use it in new ways. In Hong Kong it has even been served thinly sliced on sushi. It is driving a whole new approach to lamb, and the reaffirmation of New Zealand as the home of the world’s best lamb,. It is also an opportunity to increase the total value of lamb in this country. TE MANA LAMB is a luxury ingredient and priced at that level. In the marketplace, it has been compared to Wagyu beef, truffles and caviar for products which diners can justify paying a premium for. Since July, it has also been supplied though chef Nadia Lim’s ‘My Food Bag’ home delivery gourmet bag service. The results are very encouraging, but these are still early days and this is still a pilot project. One thing that is clear is that the demand for new authentic, quality products at the top end the market is large and real. Every farmer wants to maximise the opportunities available to them. However, the Omega Lamb Project takes the approach that to truly add value to a farm you have to look at the entire value chain. The programme works as a partnership, with the onus on creating greater overall value into the system, which everyone in the chain can ultimately share in. Pulling together that whole value chain has been a large undertaking. To achieve that requires intensive input from team members, from geneticists to farm consultants. Gilbert Enoka, who also provides mental skills coaching to the All Blacks, has been brought in to work with the project’s breeders and finishers about how to behave as a high-functioning team. When you are changing practice on a farm there is inevitably a bedding-in period. For our programme, this has included getting to grips with the technology. All the lambs need to be electronic-identification (EID) tagged. That has probably been the biggest challenge for many of our pilot farmers, but in the third year of our programme it is steadily becoming more common practice. With support from the project team, these farmers are working through this very well. All have passed the audit developed for the Omega Lamb Project and are looking at continuing with the programme for the 2018 season. The challenge now is to scale up the system, to grow TE MANA LAMB from a pilot programme to a commercial model while retaining the essential disciplines. The system needs to be more streamlined and efficient and remove costs without compromising on quality. We also need to bring on board more breeders and finishers. They need to be willing to use the technology and to adapt to a common system and keep evolving it to get better and better results. Only by following a system with genetics, and prescribed finishing, recording of key events, and responsiveness to quality feedback, can chefs be provided with the quality they are looking for, every time. A farm consultant who works in conjunction with the project liaises with breeders and finishers very regularly, usually on a weekly basis. Planning starts about 18 months out, with breeders planning the mating programme and which animals they will put the Omega ram with, and how they will structure their farm plan so they move animals with the right specifics at the right time. With finishers, the farm consultant will look at how the programme can fit onto the farm. This is looking at the climatic conditions, whether it is complementary to the rest of their business, and what they can do to meet the required timeframes. The aim is to build a strategy that does not compromise the profitability of any of the farmers, while enabling lambs to be supplied when the chicory can handle it. During the December to May finishing period much time is spent with breeders to help them make the call on when to move stock, and with finishers to determine how many lambs they can accommodate and what their projected growth rates will be. Support is also provided around agronomics. Chicory forge is quite expensive to get established and the aim is to get two to three years out of it, ensuring a sustainable diet so the lambs can grow at the optimal weight. This support for the pilot farmers is gradually reducing over time, as they have become accustomed to the processes and are very good at handling these aspects themselves. For suppliers, key factors include the capacity to have store lambs for supply to finishing programmes in late December to early January. For finishers, they include input costs, the ease of procuring animals, the performance and longevity of chicory, the additional uses of the chicory in the spring, and the lambs’ arrival and exit value. Typically, our finishers have an accomplished lamb finishing/cropping operation with a track record of innovation and high production. As for these rewards, there is still quite a lot of cost in the system, but it is essential to spend to build the market so these kinds of costs will reduce over time. Once this has been achieves, the returns to farmers will grow. The PGP’s aspirational goal is for a 30% increase in farm gate returns for the lambs over time. In the early phase, market returns are covering extra costs so farmer returns are equivalent to other lamb options. The larger issue for the farmers involved is that existing lamb options are not always returning as much as other stock classes or business alternatives, so lamb is being reduced or used opportunistically to ‘fill gaps’ in the farm business. The attraction of TE MANA LAMB is not the immediate returns, but that it provides a pathway for lamb to be once more the primary profit centre and focus for hill farm and intensive finishing operations. Delivering examples of successful, added-value ventures such as TE MANA LAMB is good for the whole industry. The farmers involved have embraced change and the results they are seeing are promising. They have identified that the programme has something for them that fits with their existing business, offering significant potential, not just for them but for the New Zealand sheep industry. Mike Tate is General Manager of the Omega Lamb Project, and developer of TE MANA LAMB, based in North Canterbury. Email: mike@omegalamb.co.nz. This article originally appeared on the NZIPIM The Journal.